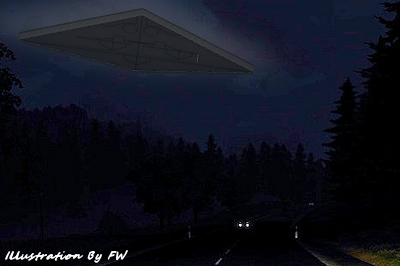 A New Mexico witness near Roswell reported watching a slow moving, triangle-shaped UFO that stopped and hovered “50 to 60 feet off of the ground,” according to testimony in Case 62824 from the Mutual UFO Network (MUFON) witness reporting database. The witness was driving an RV on a road trip and was just a few miles outside of Roswell when the object was first seen on December 27, 2014. As the witness got closer to the object they could see that it was flying very low. The witness got a good look at the unknown object. The witness tried to alert family members inside the RV. The witness stated that he was in shock looking at the object. . . .